On the occasion of Ugadi, a new poster of Superstar Mahesh Babu’s Bharat Ane Nenu has been released. It has the Superstar wearing traditional wear of ‘Panche Kattu’. The poster has created sensation and gone viral instantly. Previously, the first teaser of the movie too went viral which made it the most liked teaser in Telugu Film Industry. 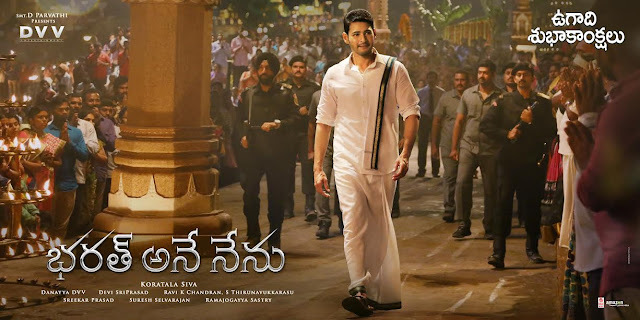 Speaking on the occasion producer, DVV Danaiah said,” On the occasion of our Telugu New Year festival Ugadi we have released a new poster of Superstar Mahesh Babu in a traditional Panche Kattu avatar. The fans and general audience have immensely loved the new look of Superstar in a Panche Kattu that is perfectly apt for the festive occasion. It is a visual treat for Ugadi”. A massive song is currently being canned by Choreographer Raju Rundaram in Hyderabad. More than 100 dancers and 1000 junior artists are participating in the song’s shoot happening in a huge Temple set on a grand level. After the completion of the song, the unit will move to Spain where a new schedule will begin from March 25. After the completion of the shoot, the unit will move into post-production and will be ready to release grandly worldwide on April 20. Superstar Mahesh Babu pairs up with Kiara Advani in the big budget commercial entertainer. Prakash Raj and Sarath Kumar play other important roles. Bharat Ane Nenu is produced on DVV Entertainments banner by DVV Danaiah. Smt. D Parvati presents the movie directed by Super director Koratala Siva. Devi Siri Prasad provides the music, Lyrics by Ramajogayya Satry where as the cinematography is handled by Thiru and Ravi K Chandran. Editing by Sreekar Prasad.